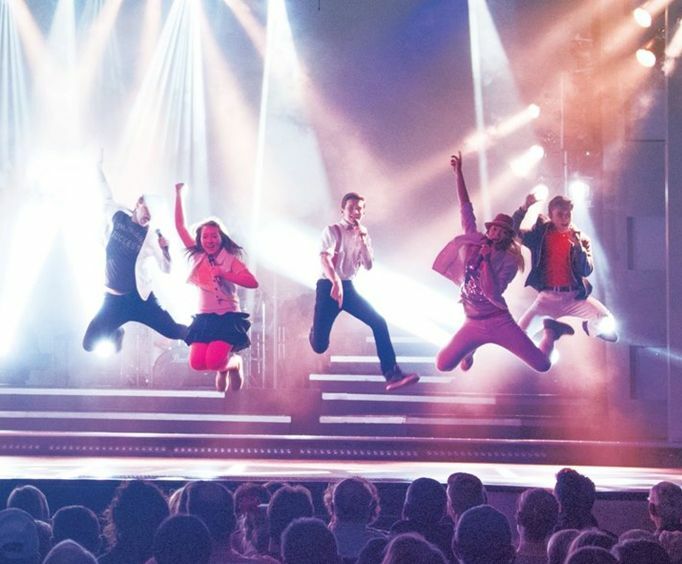 These five handsome and talented brothers will treat you to a show filled with a variety of music from pop, rock, and country to Broadway, gospel, and hip hop as they dance in unison with grace and style that leaves audiences breathless. The Hughes Brothers have been performing together for over 28 years, but they started so young that they're all under 40 years old. The brothers' impressive dance moves, amazing instrumentals and spot-on harmonies promise to deliver an unbelievable time of music, and their antics add a certain boy-like charm to the show. You can also have a tasty southern meal before the evening show begins if you make plans to come a little early. The show boasts a cast of over 50 members (and growing), as they 'keep it in the family'. Audiences delight when Marty, Jason, Adam, Ryan, and Andy bring their beautiful wives and children, who inherited their folk's many talents, onto the stage to join them. The amount of entertainment brought from such a wide range of cast makes for a fantastic performance that includes waltzes and ballet, a violin segment by the kids, and a lot of funny moments. It is complete with moving lights, dazzling costumes, and dynamic productions. You'll be clapping, dancing, and singing with the Hughes Brothers Show. The morning show was quite entertaining--all brothers were there with all their wives and tons of kids--such a wholesome show and great talent to boot. The guys love to chat with you at intermission. We have been attending the hughes brother's show for 12 years now. They first were at silver dollar city and we fell in love with them at that time. It has been fun to watch their children grow up and become a part of the show along with the wives. Best show we've ever seen in branson. The family is unbelievably talented -- the children are exceptional -- we have been raving about the hughes show since we got home. Couldn't have been better. Amazing indeed. The show was great, and the entire cast was phenomenal but the meal was the worst we've ever had. Chef cameron was very personable but the salads looked as if they had been sitting out 2-3 hours, the green beans and potatoes were cold, the pork loin was like leather and the chicken was just okay. Also, the dessert had thawed, very sad looking raspberries rather than fresh and the fact that there were only 12 dinner guests, all of these mistakes could have been avoided with a more experienced chef. We would like to see the hughes show again sometime. Tip: You have an opportunity to be a real culinary experience for you guests but i'm sorry, the food was just terrible.